Our chewy chocolatey, peanutty bites are unwrapped and more poppable than ever! Enjoy that uniquely delicious combination of crunchy roasted peanuts, molasses and original dark chocolatey flavor. 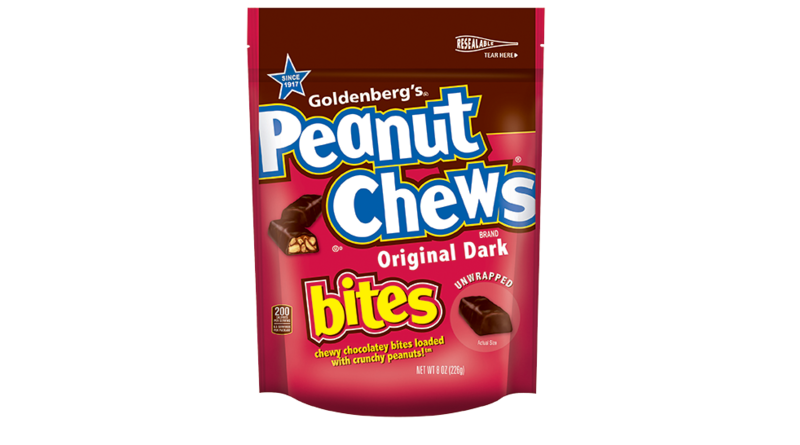 Available in an 8oz resealable bag, these new smaller PEANUT CHEWS® pieces are ideal for snacking and sharing! Take a trip down memory lane with the retro packaging version of the original GOLDENBERG'S® PEANUT CHEWS® candy. Filled with chewy, chocolatey, bite-sized goodness and loaded with peanuts. Proudly made in Philadelphia, PA. WHICH ONE DO YOU CHEWS?